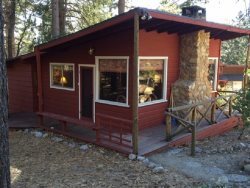 This beautiful mountain home is located 0.7 miles from the heart of Idyllwild. It is nestled down a sweet little lane surrounded by trees. Parking for 2 cars in the driveway. Outside, this property is covered by trees and plants that surround a large deck with two picnic tables and a propane grill. Perfect place for outdoor dining or just to sit and relax with a glass of wine or your morning coffee. Sit quietly and you will see so many critters that live nearby. Squirrels, chipmunks, birds, and probably deer. This is a really quiet blissful property. You enter into an open floor plan room with dining room living room and full bathroom off of them. The living room has lots of cozy seating that surround a big TV and a giant natural stone fireplace. Perfect place to snuggle up in the winter with a book or to watch a movie. There are tons of windows surrounding all of these rooms so the natural light is perfect and vaulted ceilings with wood beams complete the "mountain" feel. Just off the living room, is the kitchen complete with breakfast nook that has a custom maple picnic table for the perfect breakfasts. The kitchen is a good size and has top of the line everything and is fully stocked to make meal prep a breeze and a pleasure. Very clean and modern while still maintaining the casual cabin feel. Back through the living and dining room, and down the hall are one bedroom with two twin beds, one room with a Queen bed, and the master with a king size bed and it's own bathroom with shower. The master also has it's own wood burning fireplace and a darling bay window with window seat. This house is really beautiful and you will certainly have the vacation of a lifetime here.